If you don’t know exactly what you’re looking for, finding a place to stay in Miami can be a little confusing. You want to make sure you stay in the part of the city that’s right for you and not end up far from all the action because the hotel advertised it was near South Beach, when in reality it was 10 miles away. Here is a breakdown of the different types of hotels you will find, and how Miami lodging works. 1) Hostels: Are you on a budget, or traveling alone in Miami for a few days? Then a hostel is the place for you. They offer private or shared rooms at a ridiculously cheap price, starting around $12 a night. Many offer free meals, and all have a bar serving cheap drinks, free wifi, and a party atmosphere to go along with it. More attractive for the young traveler, hostels are only located in South Beach and are a great cheap alternative to the hotels in Miami Beach. 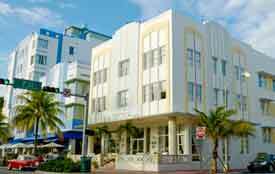 2) Art Deco Boutique Hotels: Many of the hotels you find in Miami Beach are known as Art Deco Boutique hotels. These are small hotels made from refurbished apartment buildings from the 1920s and 30s, when Miami Beach was first built. The hotels are preserved buildings, and are usually only two or three floors high. The hotels are found along Ocean Drive, Collins Ave and Washington Ave between 1st and 17th street. Nearly all of these hotels have renovated the lobby area into restaurants and bars, and in fact all of the restaurants you find along Ocean Drive are actually inside Art Deco hotel lobbies. Most of the Art Deco Boutique Hotels are independently owned, with smaller rooms, and rarely have swimming pools. Quality can be hit and miss with these hotels so it is always a good idea to check the reviews. I might even call the front desk to see how friendly they are. These hotels are often far cheaper than their chain counterparts, so they can be a great way to come and stay in South Beach for a reduced cost. 3) Oceanfront Hotels: The bigger hotels are found along Collins Ave starting at 15th St. These are big high rise hotels, with private swimming pools, direct beach access, and usually a section of the beach reserved for hotel guests. They offer amenities such as gyms, free wifi, laundry service, and many of the hotels also have bars and nightclubs inside. Most have restaurants with an ocean view, and on the weekends you will find the larger of the hotels hosting pool parties. These hotels are the more expensive and exclusive places to stay in South Beach. 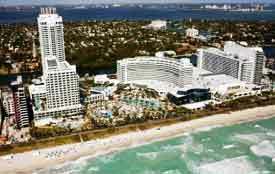 4) Mid Beach and North Beach Hotels: While most choose to stay in South Beach, Miami Beach also has oceanfront hotels along the beach in Mid and North Beach. This area is still in Miami Beach, just further north along the coast by only a few miles. These hotels are a little less expensive, and still have all of the amenities of the South Beach hotels. You can often find cheaper hotel rates if you choose to stay north, plus enjoy a quieter stay and a more secluded beach. South Beach is only a short bus or cab ride away. 5) Downtown Miami and Brickell Hotels: For many people, Miami is the first and the last stop of their vacation before going on a cruise. The hotels in downtown are typically less than a mile from the port, which makes them a convenient place to stay. There is a range of options to choose from, such as the Holiday Inn, to luxury hotels such as the Epic and Mandarin Oriental. The big, high-rise hotels offer amazing views of the city. Whenever I’m staying in a high-rise hotel, I always request the floor, and the view, when I’m negotiating the price of the room. 6) Key Biscayne and Coconut Grove: Key Biscayne is a 40 minute drive from Miami Beach, accessible only by car via a toll bridge. It costs $40 in a taxi from Miami airport, and if you do not have a car for your vacation, it is an isolated area. The same goes for Coconut Grove. It is a busier area to stay than Key Biscayne and is a student neighborhood due to its proximity to the University of Miami. Both areas are good if you do not intend to leave the hotel during your stay and want to relax by the pool all day. 7) Miami Airport Hotels: Miami’s International Airport is located about 10 miles from Miami Beach and 7 miles from the Port of Miami. 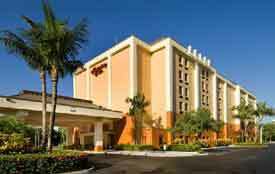 There are many chain hotels nearby the airport that offer a cheap night’s sleep, as well as free breakfast and shuttle service, unlike the hotels at the beach. The Embassy Suites and the Sofitel are two of the nicest of the airport hotels. 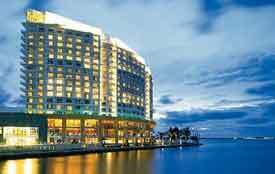 8) The Surrounding Areas: Miami Beach isn’t the only place to stay. However, if you choose a hotel in Coral Gables, Coconut Grove, Key Biscayne, Sunny Isles, Hollywood, or Dania, renting a car is a good idea. 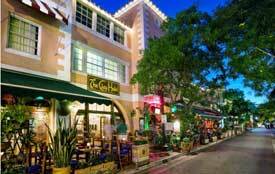 Coconut Grove is near the University of Miami, and has a large marina, as well as an artsy neighborhood feel to it. Key Biscayne is a small, 6 mile long island, with a beautiful state park and beach. Sunny Isles is further up from Miami Beach, but still has a long stretch of golden beach. Wherever you choose to stay, Miami always has something for everyone. 9) Vacation Apartment and Vacation Home Rentals: If you are in a big group, enjoy doing your own thing away from the crowds, or just prefer to keep to your own schedule, vacation rentals can offer a cheap and easy way to vacation in Miami. You can stay long or short term in apartments or houses that are privately owned and enjoy your time here with your own kitchen, more space, and a more private place to stay. While Miami offers a huge range of places to stay, all fall into the above categories. So once you know which type of place suits you best, you’re on the right track for success. Just don’t forget to call the hotel and ask for a discount, and always check the reviews! See the hotel rates calendar for an overview of the prices throughout the year.